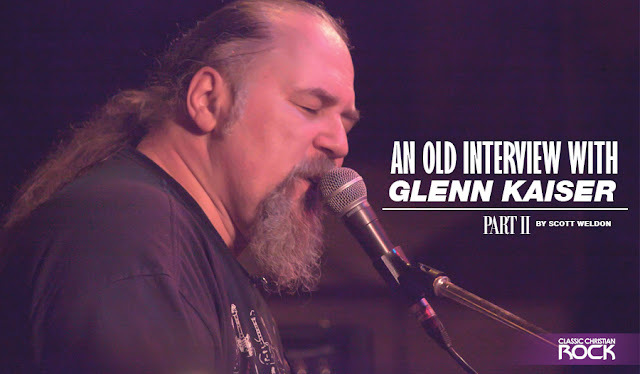 Part One of this 1988 interview with Glenn Kaiser dealt mostly with the new record, Silence Screams. But in discussing the themes behind that record, the idea of being involved in social/political issues comes up. Especially since that was an election year in the US, we moved into a discussion of those issues that still resonates today. The conversation then comes back to the new release, changes in the band, and future plans. So here is part two of my interview with Glenn Kaiser. Scott: You've mentioned a couple times about people getting involved, and it's widely known how involved you guys are in social issues and that kind of thing. With this being an election year and all that kind of stuff, how active do you think Christians should be in their support of politicians? And is that really important? Some people will say we have a responsibility as Christians to be out there working for these things; while other people say, well no politics is separate from religion. Glenn: Well, Scott, it's a good issue. It's an important issue and a good question. I think...I think that I am political because I have no alternative. Anybody who really loves their neighbor, truly loves their neighbor, eventually gets involved at some level in regards to politics. Because, face it, who runs the world? I mean, God runs the world, or Satan depending on which world you're living in. But ultimately, it's the Lord. But in the natural, in the natural, down here in flesh and blood 3D on the planet, it has to do with human beings who have money, who have power. And you ultimately boil it down to politicians, to the folks that have the wealth, and I'm sure that we have to include the other authorities such as police forces, people like CIA and KGB, and the judicial system within each country. And so, sooner or later when you're coming against evil, if you're truly storming the gates of hell, if you are biblical and you really believe what the Bible says, if you're a biblical Christian, and if you're a thinking Christian; sooner or later your involvement is going to bring you into head to head confrontation with the powers of this planet. Now, it says we don't fight flesh and blood. So ultimately it is a spiritual battle. You know, it is between God and Satan; it is between the Lord's angels and Satan's demons. There's no question that it boils down to light and dark, the Christian against the non-Christian. There is no way. And the Bible prophesies this, and it's going to be clearer and clearer. Now, on the other hand we have a lot of Christians who jump up and down on the end time prophecy and say, "Aha! It's happening." Well, for example the whole idea of the Tribulation...ask somebody who live in a communist state whether or not there's tribulation. You know, even in Glasnost and Perestroika, you have Christians who are in mental institutions being injected with very painful drugs, who are separated from their wives and kids; women who are being beaten, who are going through all kinds of abuse in very cold, dank, stark prisons in the Soviet Union and in Albania, in Bulgaria, in other communist satellites, etc, etc. Ask them when the Tribulation's gonna be. You know what I'm saying? They're perspective is different. And although a lot of us get real excited saying, "Aha, the signs of the times, and the Lord's coming." Well, yes He is, and I believe that, and it very well could be within my generation that Jesus returns. And yet, don't you think that the Christians who were thrown to the lions in Rome said the same thing? And even there, stop and think, what happened? You see, Jesus said, "render unto Caesar what is Caesar's" and He also said, "render unto God what is God's." There is a time when God in His course, it's a collision course for us Christians against Caesar and his course. don't think Christians can sit on their hands and stay totally out of politics. At the same time, I think Billy Graham, one of our real elder statesmen, who seriously I believe is a very godly man; he realized over the years that he made a big mistake to put his, both feet, in his mouth sometimes in terms of supporting Nixon and different ones. So, I think it's better to seriously pray, if you can't debate in the Spirit, you know, don't argue with people over who you're voting for. You have to ultimately vote for the person that you feel is most biblical in their basic concepts. But even then it takes a great deal of prayer and faith, because how many of these guys are really going to do that much once they get in? How many promise one thing and they get there and they do nothing? But I don't, again, I just don't think we can be a-political and so "Oh yeah, it's all God and demons, and we'll just pray." (laughter) If that's the case then you shouldn't work, you know, you don't need to deal with any of the other practicalities of every day life. Why bother? It all boils down to the spiritual battle, but we're human beings, we live on a planet, big decisions are made by people in high places. And certainly, the Christians, and I've said this for years, the Christians are the conscience of the world. If we don't get involved, if we don't love, if we don't care, if we don't lift up the rights of the unborn, the rights of oppressed people...see, it sounds political, doesn't it? Sounds almost Marxist or something. But if we don't care, and if we don't do, then as far as I'm concerned it's a lot of hot air, you know, a bunch of wind bags who call themselves Christians. I can't, I didn't get saved for that. You know what I'm saying? I didn't become a Christian to just hear myself talk. So ultimately, it boils down to action. Yeah, we have to deal with it. Scott: OK, Iost track. I had something I was going to ask, and I forgot what it was (laughs). This is so great because I don't have to ask anything, and you're just telling me everything I want to know. Glenn: (Laughs) You know, I go on and on. For one reason, I'm a preacher; but another reason is the Lord has us involved in so many things. We really are involved in just so many different issues. It boils down to loving your neighbor as yourself, that's all. Scott: When can we expect the new album? It's not out yet. Scott: Well, I'll be going to the store tonight. Glenn: You should. Albums and cassettes and CDs. We're sending singles around. And, uh, you know it's just one of those things. I kind of laugh, I think "Hey, there are a lot of bands that'll get airplay, but this band, we're one of the first weird bands playing weird, loud rock music. There's this reputation that follows us around. It's kinda funny, you know, again I really don't lose sleep over it. But I think it's kind of funny. People are afraid, you know, and I don't know, maybe the songs aren't that good, or maybe what they're saying doesn't...you know, this is hard to drink coffee and enjoy life over. You know, this morning I wake up at 8:00 and I hear Rez Band, you know. But, somebody has to do it, you know what I'm saying? Somebody has to say "enough is enough, what happened to the cross? What happened to sacrifice?" "White Noise", "2,000", a number of songs, and we're co-writing a lot. So he's going to add a lot more life, too, to the concerts. I'll be preaching, obviously we'll continue to do clubs off and on; that's something that we really believe God called us to do several years ago, and move away from the Christian music scene. But, for a number of reasons, it became very clear to us and to the pastors within the community here. It wasn't based on finances, it wasn't based on hate mail or anything, 'cause everybody was actually really supportive of Rez moving away from the Christian music scene as such. But the Lord's really confirmed for us to come back and to start dealing again with this kinds of issues. A lot of letters, a lot of calls, people said there has to be a voice, somebody has to have the courage to really square off in these concerts and challenge people. And I guess maybe that's one of the reasons that Rez continues on after all this time. We need all kinds of sermons, and all kinds of preachers, and all kinds of bands, and all kinds of solo artists. And various worship kinds, you know, worship styles and worship leaders in the body of Christ. But we also need challenge. And so, the Lord really confirmed for us to do that, so it's happening. That's what's on His agenda for Rez, and for people who show up at our concerts this year. I don't know, it's like we're going in both directions at once. Talking to 14-15 year old kids on the street, I'm asking them all the time, "Hey, what's your favorite band? Where's music at for you?" People are saying Led Zeppelin, and in the same breath, you know Metallica or Slayer or Poison or Guns N Roses or somebody. It's interesting. Here's a kid, you know when I was 14 and 15, man, my favorite band was Led Zeppelin. And kids are saying Zeppelin. But in the same breath they're talking about a very new band, you know, very young group. So, that's what we're doing musically on this album, and the next album will even go further in that direction. But I think we're going to go further back to an "Awaiting Your Reply" approach. I intend to pull out the dulcimer, working with harmonica, doing blues based rock. But, anyway...that's for next year's interview (laughter).